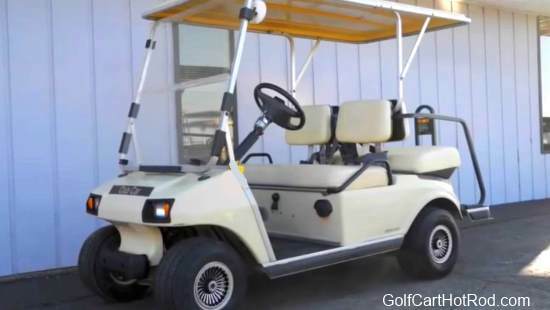 Yamaha Golf Carts have been bad about changing the location of their Serial Numbers over the years. 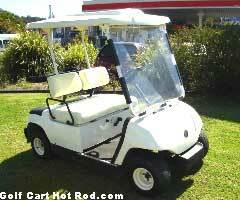 They have more models of golf carts than other manufacturers. There is a long list of Serial Number and Year locations. The serial number is located on the frame cross member, under the back bumper, stamped into the frame. It could be located anywhere along the cross member. If the frame is dirty or rusty, it may be difficult to find. The serial number code is arranged as follows: JXX-XXXXXX, which designates the model. The model number can be found it the chart below with the corresponding year. The serial number is located on the frame cross member, under the back bumper, stamped into the frame on the passenger side. If the frame is dirty or rusty, it may be difficult to find. 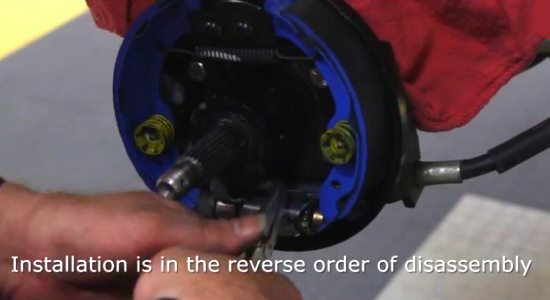 The serial number is located by lifting back the seat cover on its hinge. It is located on the frame cross member in front of the engine down by the floorboard where the cover hinges. The serial number is located by lifting off the seat. Near the location of the passenger side seat hinge support, you will find a vertical support attached to the frame. On the inboard side of the vertical frame support you will find the serial number tag. The serial number is located in various positions on these carts. 1. The easiest one to look for first is a tag located on the drivers side, under the glove box, running vertically, and next to the rubber edge strip. The next two possible locations require lifting off the seat. 2. Near the location of either the driver side or passenger side seat hinge support, you will find a vertical support attached to the frame. On the inboard side of the vertical frame support you will find the serial number tag. Yamaha serial number codes are arranged as follows: JXX-XXXXXX, which designates the model. The model number can be found it the chart below with the corresponding year. Copy and Paste this link in your browser to go to the official Yamaha web site to find the serial number location of your golf cart. Copy and Paste this link in your browser to go to the official Yamaha web site to find the serial number codes for the year of your golf cart. Bruno: It is a 1992 G9A model.